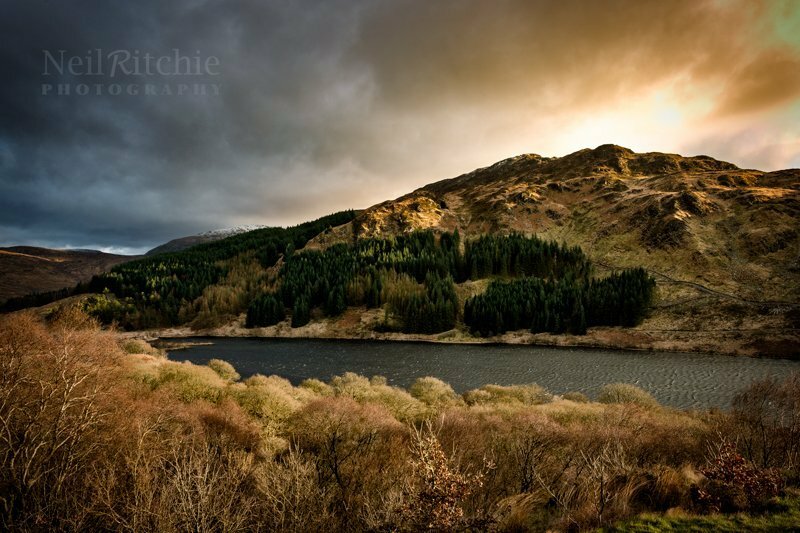 In April 1307, Robert the Bruce won a small but important victory at the Battle of Glen Trool on the shores of Loch Trool in Galloway. It was the beginning of a seven-year campaign in Scotland that would culminate with his victory over Edward II of England at the Battle of Bannockburn in 1314 – although the war would continue until 1328. This period was however not just a struggle against the English Crown, it was also one of civil war. When Alexander III of Scotland – the last of the House of Dunkeld – died in 1286 the crown passed to his only surviving descendant, his granddaughter, Margaret of Norway, known as the Maid of Norway. In 1290, on her way to Scotland, Margaret died in the Orkney Islands, at the age of seven. This triggered a succession crisis and to avoid civil war the nobles of Scotland invited Edward I of England – a close friend of the late king – to intervene and help choose the strongest claimant. The man he picked was John Balliol. King John ruled Scotland with Edward I as his feudal superior. Edward began interfering in Scottish affairs, undermining King John. The final straw came in 1294 when King Edward requested that Scotland provide troops and funds for his campaign against France. A number of powerful Scottish lords persuaded John to refuse. Edward responded by invading Scotland at the head of a large army. The Scots were defeated at the Battle of Dunbar in April of 1296. This brought to an end almost a century of a close and stable relationship between the two kingdoms. In July, King John was deposed and imprisoned in the Tower of London. Edward convened a parliament at Berwick, where the Scottish nobles (Robert the Bruce among them) paid homage to him. Scotland had been effectively placed under Edward’s rule. In all these aforesaid campaigns the Scots were so divided among themselves that sometimes the father was on the Scottish side and the son on the English, and vice versa; also one brother might be with the Scots and another with the English; yea, even the same individual be first with one party and then with the other. But all those who were with the English were merely feigning, either because it was the stronger party, or in order to save the lands they possessed in England; for their hearts were always with their own people, although their persons might not be so. A revolt by the Scottish nobility against Edward in 1297 ended in capitulation at Irvine in July of that year. William Wallace and Andrew Murray continued the resistance and their forces inflicted a stunning defeat on the English at the Battle of Stirling Bridge on 11 September 1297. The following year Wallace was defeated at the Battle of Falkirk by an English army led by Edward himself. In 1305 Wallace was captured and executed. In February 1306, Robert the Bruce, Earl of Carrick, made his move for the vacant Scottish throne in rather dramatic fashion when he and his supporters killed his rival, John ‘The Red’ Comyn, Lord of Badenoch, before the high altar inside Greyfriars church in Dumfries. Bruce was – unsurprisingly – excommunicated for this and was now in open rebellion against King Edward. When the news reached Edward, he appointed Aymer de Valence, 2nd Earl of Pembroke, to take care of matters in Scotland. Valence was the dead Comyn’s brother-in-law and was also Bruce’s cousin. Six weeks later, on 25th March (New Years Day in Scotland at that time), in the abbey of Scone, Bruce was crowned King of Scots by William Lamberton, the Bishop of St Andrews. In June, Valence moved to Perth where he established a base. Here his English army was joined by a large number of Comyn supporters. King Robert came to the walls of Perth and offered battle, however, Valence declined and Bruce withdrew a short distance to make camp at Methven, just to the west of Perth. Bruce had wrongly assumed that since Valence had declined a fight he must be in no position to give battle. Just before sunrise on the 19th June, Valence surprised Bruce by moving his army out of Perth to attack him – Bruce was lucky to escape. Fleeing into the Western Highlands with the small number of troops that he had left, Bruce suffered another military setback, inflicted by the leading Comyn supporters in Argyll, the MacDougalls of Lorne, at the Battle of Dalrigh, just outside Tyndrum. Bruce was again lucky to escape. King Robert, no more than a fugitive at this point, fled – it is believed – into the lands of the Lord of the Isles, before returning to his earldom of Carrick, in south-west Scotland, via Kintyre and the Isle of Arran in early 1307. In south-west Scotland Bruce was back in territory he knew well and was determined that he would not be caught off-guard again. To bring more men under his banner, a military success, no matter how small, was essential for Bruce at this point as not many were willing to risk their lives in what was seen as a failed cause. For King Robert, pitched battles were not an option; he would have to use tactics that suited a small and irregular army if he was to succeed. Bruce’s first success in this new campaign came in March at his own castle of Turnberry, on the Ayrshire coast, which was now occupied by an English garrison commanded by Henry Percy. A detachment of the garrison was billeted in the settlement outside the walls. Bruce led an attack against them, killing a large number and forcing the survivors to take refuge inside the castle. Shortly afterwards the garrison withdrew, abandoning the castle. On their retreat south, Henry Percy and his remaining forces sacked the nearby Crossraguel Abbey. 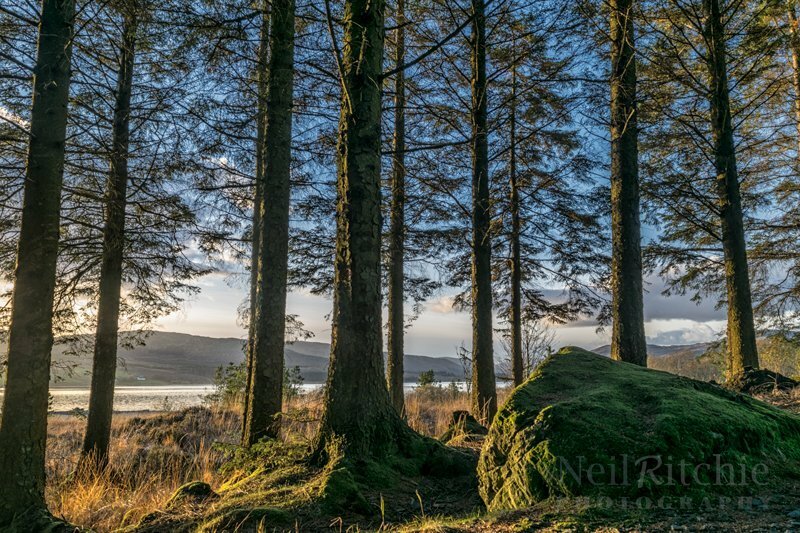 Bruce then made his way into Galloway and launched a sucessful surprise attack on a small English force camped on the eastern shore of Clatteringshaws Loch. This is also the site of another ‘Bruce’s Stone’. On hearing of Bruce’s return, Valence (possibly now based at Ayr, other accounts say Carlisle) began to move against him, with around two thousand troops. 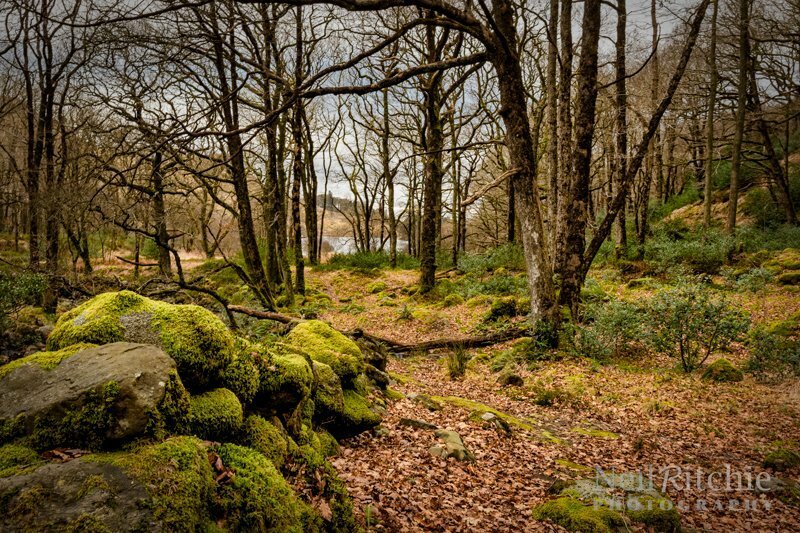 He soon received reports that Bruce and his small army (about a few hundred) were camped at the eastern end of Loch Trool in Glen Trool. The approach to Bruce’s camp was not easy. Valence appears to have been approaching from the west along the southern shore of the loch, and the narrow track that he was following was bordered by a steep slope on his right, with Loch Trool to his left. This forced Valence’s army, which contained a few hundred cavalry, almost into a single file as they made their way towards the objective. It is possible that the English horsemen dismounted for the final approach, as the terrain would not be suitable for the cavalry to effectively operate, however, an English account mentions the loss of a number of horses in the engagement. 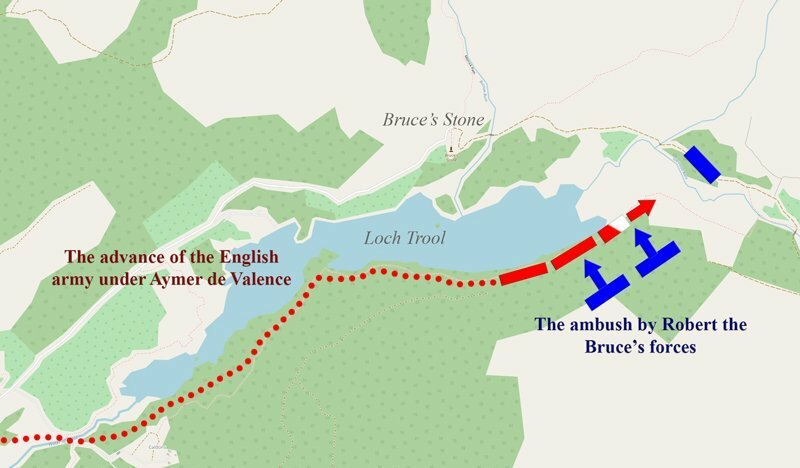 As Valence’s force reached the head of the loch, Bruce gave the order to attack, his men rolling boulders, hurling rocks and firing arrows down on the enemy before charging from their elevated positions up on the steep slopes, known locally as the ‘Steps of Trool’. Bruce’s men charged into the centre of the English line, cutting the force in half. With little room to manoeuvre on the rough, broken ground, the English forces were unable to form, let alone maintain, any military formation and were cut down with heavy losses. With this, Bruce had won a small but nonetheless important victory, greatly boosting morale and gaining more support. 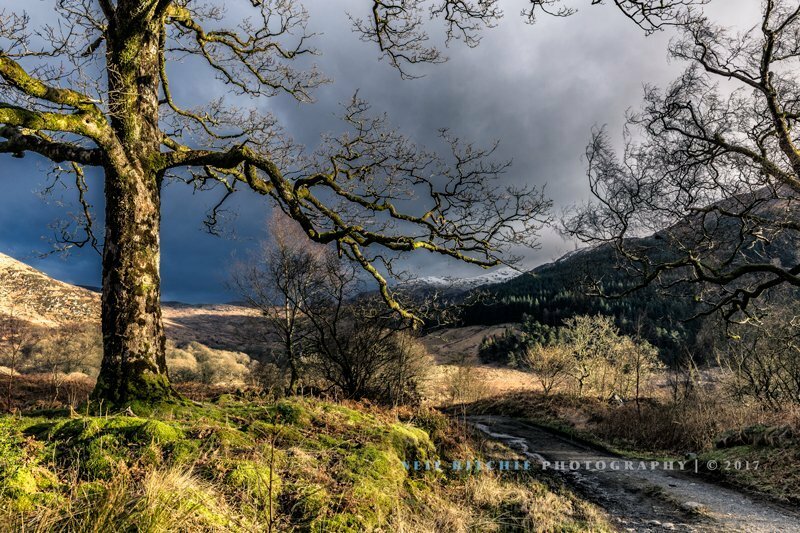 Some sources say that following the Battle of Glen Trool, Aymer de Valence advanced again on Bruce’s position, this time from the north, with a force containing a large number of highlanders from Argyll that John MacDougall of Lorne (nephew of John ‘The Red’ Comyn) had sent. MacDougall himself was advancing from the south and both he and Valence were most likely aiming to trap Bruce between their armies. Bruce saw the danger and withdrew over the hills, making his way towards Lothian before heading into Ayrshire. The Battle of Glen Trool laid the foundation for Robert the Bruce’s next victory on the 10th of May, at the Battle of Loudoun Hill in Ayrshire, against a much larger English army, again led by Valence. It would, however, be a number of years before his crown – and Scotland – was secure. In 1307, the campaign against the English forces, as well as those Scots who were opposed to Bruce, was just beginning. The soldiers that were killed in the battle are believed to be buried not far from the battle site in an area known as ‘Soldiers’ Holm’. 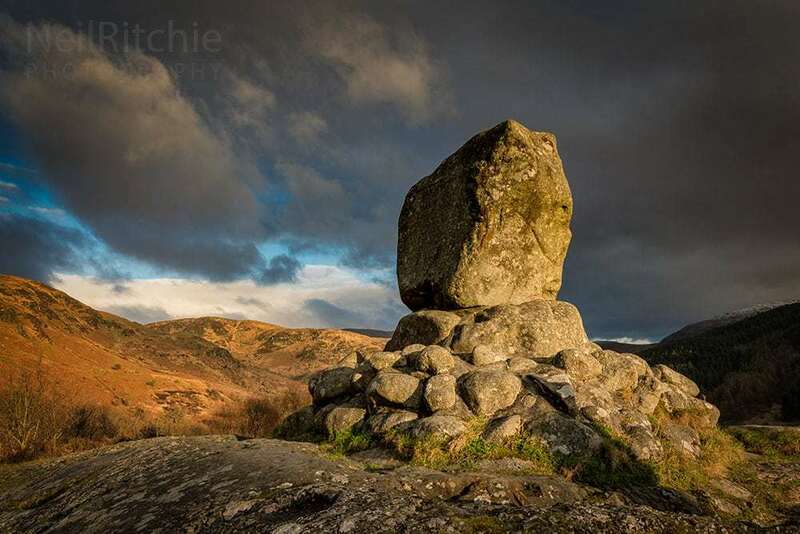 To commemorate the battle, a large boulder (a fitting tribute) was erected on the opposite side of the loch, overlooking the battle site and from where, according to legend, Bruce gave the signal to launch the attack. It was unveiled on the 5th June 1929, the 600th anniversary of Bruce’s death. Note: The exact date of the Battle of Glen Trool is not known, although it is generally accepted that it took place in April. Records show that troops were assembled at Carlisle and Ayr in April 1307 for the purpose of hunting down Bruce in Galloway. The inscription on Bruce’s Stone records the engagement as March 1307. A.A.M. Duncan in his translation of Barbour’s The Bruce stated that the battle could have taken place in June, which would mean that the Battle of Glen Trool took place after the Battle of Loudoun Hill fought on 10th May 1307.